DIVE RITE CAM STRAPS ARE AVAILABLE IN SEVERAL OPTIONS. NO MATTER WHAT THE APPLICATION IS, DIVE RITE HAS A CAM STRAP THAT WILL WORK FOR IT. ALL CAM STRAPS ARE SOLD INDIVIDUALLY AND ARE MADE IN THE USA. 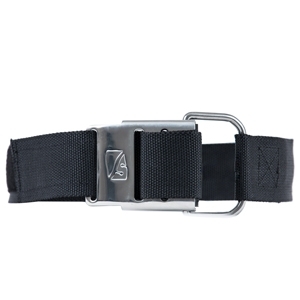 The STAINLESS STEEL CAM STRAP WITH ROLLER BUCKLE uses a 2-inch wide nylon webbing with marine grade stainless steel buckle. 36 inch (91.4cm) webbing length is suitable for cylinders from 6.9 inches (17.5mm) to 8 inches (20.3cm) in diameter, which includes them most popular sizes of cylinders. Also available in a DUAL-LENGTH version with a 52 inch (132cm) length. NOTE: The dual length cam strap includes x2 rubber non-slip pads. Nylon rollers on the cam strap protect the cylinder from being scratched by the buckle, while a rubber non-slip pad prevents the cylinder from shifting once the cam buckle has been secured. Excess webbing is secured using Velcro, which will also prevent the buckle from accidentally coming open. This cam strap comes standard on all Transpac XT, VoyagerPac, and TravelPac systems.